Probably 2017 Honda CR-V. Looking for excellent reliability, good gas mileage, reasonable interior passenger room, peppy engine. 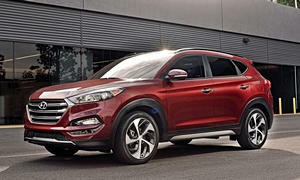 The Hyundai Tucson or Santa Fe are both worth a look, as are the Kia Sportage and the Mazda CX-5. 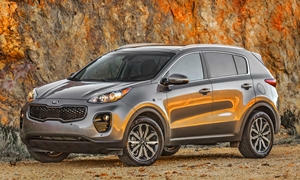 The Kia Sportage has one of the worst MPG figures in the segment. 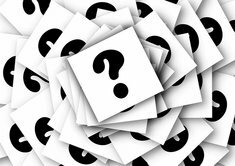 The small SUV segment is not a segment known for having powerful engines. 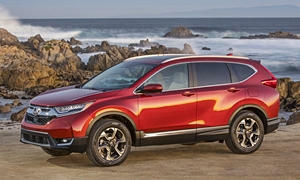 However, the CR-V would be my first pick, followed by the CX-5 and RAV4 Hybrid. The Subaru Forester also has a powerful turbo engine optional. 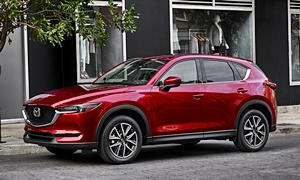 The new 2018 Mazda CX-5 has the best exterior styling BY FAR. 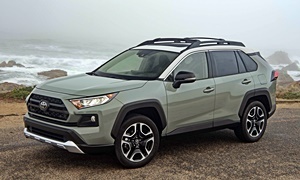 The RAV4 is the largest and most roomy on the inside. The CR-V has a nice interior. All of them are slow. 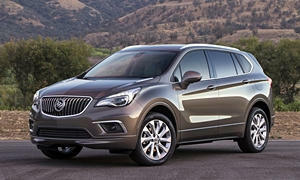 The 2016 Buick Envision Premium l can be had for right around $30,000, which about 1/3rd off MSRP it includes leather, AWD, 2.0T with 250 horsepower, and Buick's Quiet Tuning which it makes it quieter than all of those already mentioned. We are getting 23-24 combined and 30+ on the highway.